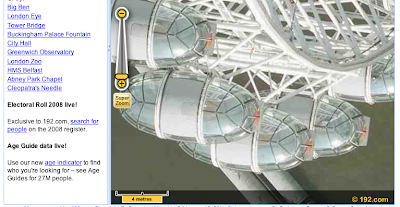 192.com has published the highest resolution imagery of London we have seen. Coming in at a staggering 4cm resolution the imagery is of such quality to pin point individuals and with it come privacy concerns. The map, from 192.com, publishes aerial photography at a resolution of 4cm for London and 12.5cm for the rest of the UK. In the right conditions, images at this resolution are enough to identify individuals - a step that existing online mapping ventures such as Google Earth and Microsoft's Virtual Earth have so far been careful to avoid.